Thickness is vertical compressive strain comes to the subgrade due to the standard axle laden of magnitude 8.17 kN (8170 kg) , if more than this causes permanent deformation in form of rutting. The maximum rutting can be accepted in village road as 50 mm before maintenance and the analytical evaluation can be done according to IRC:37. 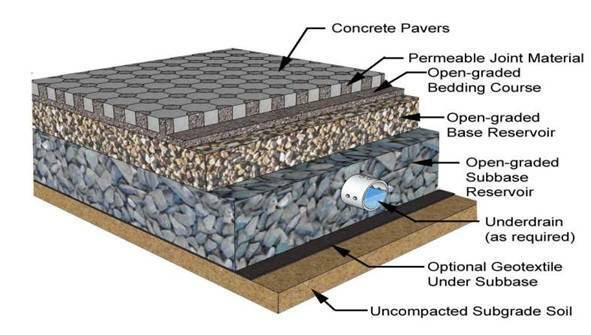 For rigid and semi-rigid pavement tensile stress is taken as the design criteria. As per the IRC:37 design traffic should be 0.1 msa to 2 msa (million standard axles). Weight of commercial vehicle (laden) is considered as 3 tonnes or more. For design traffic we consider the existing traffic and rate of growth. Traffic study should be done as per the IRC:9. The no. of years to be taken until the major reconstruction. Design life depend upon the environmental conditions, materials used ,maintenance etc. For rural roads design life of 10 years is considered. In low volume roads for the thin bituminous surfacing design life of 5 years is considered. To provide support to the pavement as its foundation. Top 30 cm of the cutting or embankment at formation level in rural roads consider as subgrade. A minimum of 100% of standard proctor compaction should be attain in subgrade. For clayey soil 95% and moisture content of 2% in excess of optimum value. Soil below subgrade should be compacted to 97% of standard proctor compaction. Conduct on sample which remoulded at OMC and dry density. Test should be done per km depend on soil type. If CBR less than 2% for 100 mm thickness then minimum CBR of 10% is to be provided to the sub-base for CBR of 2%. If CBR more than 15% , no need to provide sub-base. Thickness of surface course depend upon the traffic volume and type of material used for it. For gravel roads extra thickness should be provided because of lost in thickness due to the traffic action. Bituminous wearing courses must be made up of good quality aggreagate with aggreagate impact value not exceeding 30 % in order to reduce degradation of aggregates by crushing.